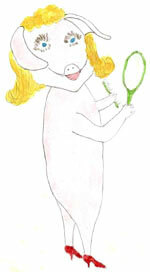 PiggiPink was reading a book, PiggiPeaches was admiring herself in her mirror as usual, and occasionally combed her hair. 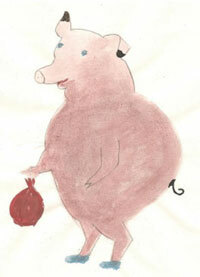 and PiggiPlump was trying to decide whether she should have another biscuit from her little red bag. But things just weren’t lively enough for PiggiPirate. “Let’s play team games,” he said, “boys against the girls.” “That wouldn’t be fair,” said PiggiPeaches, “because the boys always win.” PiggiPlump did not agree and said that she would be quite willing to play any game against the boys. PiggiPink said that she wasn’t very good at games but would be happy to join in. 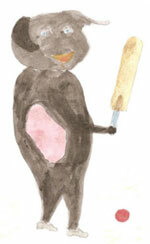 PiggiPatch thought that the boys could beat the girls at almost any outdoor game and suggested they played cricket. The girls thought this would be quite unfair because they knew how good PiggiPatch was at his favourite game. “No,” said PiggiPlump, “we don’t want to play cricket but we will play you at football.” The boys agreed, as they thought they would win quite easily. They put a goal at each end of the garden and placed the ball in the middle of the pitch. PiggiPanda was the goalkeeper for the boys’ team and PiggiPlump was in goal for the girls. PiggiPrincess blew on a small whistle and the game began. PiggiPirate passed the ball to PiggiPatch who dribbled around PiggiPeaches. This he found rather easy because PiggiPeaches was admiring herself in her mirror again. He then pushed the ball through PiggiPink’s legs and took a shot at goal. 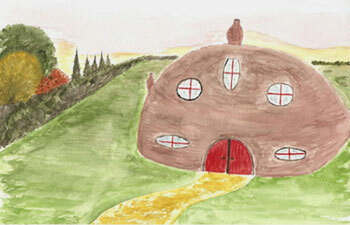 The ball hit PiggiPlump and then rebounded half way up the pitch towards PiggiPink. 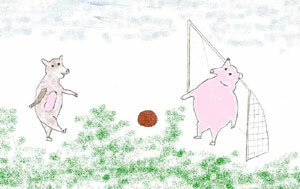 PiggiPink shuffled the ball forward to PiggiPeaches who then pushed it with her mirror towards PiggiPanda in goal. PiggiPanda was able to save quite easily. Although the boys had lots of shots at goal they just could not get the ball past PiggiPlump who managed to get her body in the way every time. When PiggiPrincess blew the whistle for the end of the game the score was Boys: 0, Girls: 0, a draw. Everyone was very hot after their football match, so they were extremely pleased to see that PiggiPrincess had made a large jug of lemonade and had set this out with cups on a small table on the lawn. They were all extremely thirsty. 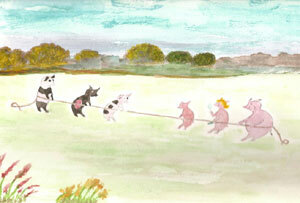 After they had rested for a while PiggiPirate thought they might have a “Tug of War” contest. He had found a long piece of rope in PiggiPete’s garage and told PiggiPanda to tie one end around his waist. PiggiPlump did the same at the other end of the rope and the others took up their positions along the rope. When PiggiPrincess blew the whistle they all started to pull as hard as they could. The boys pulled and pulled but found they could make no progress. With PiggiPlump at the other end of the rope all their efforts were in vain. PiggiPlump then told her team to pull as hard as they could and asked PiggiPeaches if she would mind putting her comb and mirror down for just a moment. Soon the girls were able to pull the boys towards them, especially with PiggiPlump now leaning backwards and puffing her cheeks out with her effort. The girls were the winners and how pleased they were. “Three cheers for the girls,” shouted PiggiPanda. PiggiPink was more delighted than anyone that her team had won. “I don’t think I have ever won a game before,” she exclaimed. PiggiPrincess reminded them that it wasn’t always the boys who won at outdoor games.